I’m working on another edit. I hope to continue with the other two prequels. So… don’t curse me, but I always kinda liked Episode I. Yes, there are many problems. Many. But in the end, with every one of them I came to some kind of acceptance. Apart from Jar Jar and young Anakin. On the other hand, though, TPM has a pretty good mixture of real sets, puppets, and CGI. It feels way more realistic than Episode II, which is the worst SW movie by far IMHO. The duels are among the best of the saga, I don’t mind the political subplot, and the soundtrack is so cool. Anyway, I’ve been intrigued by Sheepish edit, so here it is. EDIT: I had to change my plans. I can’t make the edit begin with Tatooine. The movie would just be around 1hr, because I would have to cut all the “We need parts for the ship” sections. Complete color correction, to give a more grounded feel. Many changes in voice pitch. Padme sounds a little bit younger, Anakin a little bit older. About Gunray and his companion, I lowered the pitch at minimum, so that the audience cannot understand what he is saying, and so that I can add subtitles (but this is just a test. Considering that I’m not american nor british, TO ME it sounds ok, but I’ll need some comments about it). Naboo is Alderaan. That’s an idea already established in the crawl. Plus, by removing any mention of Naboo and working with subtitles, that can be achieved. Added OT soundtrack whenever I can. The invasion of Alderaan happens just after the Jedi speak with Gunray aboard the ship. It makes the Federation more threatening. Reduced Qui Gon and Obi Wan talking. Gunray and the other fear the Jedi, but not that much, and they blame Sidious for not forseeing that. Different montage in the duel with the droids. Not “Is that legal?”, “I will make it legal”. The Jedi don’t “Force run”, to fix the plot hole of Obi Wan not running to save his master at the end. Reduced Jar Jar introduction. He just says his name and then he is interrupted by the droid on its bike. Entirely removed the trip to gungan city. Completely useless. Plus, we keep the “revelation” of the number of gungans for the third act. Obi Wan, Qui Gon and Jar Jar simply smuggle into the city to save the queen. Reduced bad Keira Knightley acting. Droids simply say that they are under arrest. Reduced space escape. R2 just repairs the ship and they leave. Added OT Tatooine music when R2 is presented, and when they walk into Tatooine city. Fake queen does not order Padme to clean the droid. No Jar Jar stepping on a poo. Cut Watto saying that mind tricks don’t work on Toydarians. Exchange between Padme and Anakin moved after the Qui Gon and Watto scene, and reduced. Also Jar Jar reduced. When the kids look away, it’s not because of Jar Jar, but because Qui Gon re-entered the shop. I think it flows quite well. No “I was glad to meet you too!”. And no “Yuppie!”. Trimmed dinner sequence. Reduced Anakin, Jar Jar and Qui Gon. Trimmed Qui Gon and Shmi’s sequence. No Christ metaphor. Plus, this scene is important because it is the first scene that shows the Jedi how I want them to be shown. Good people, but cold and proud. Qui Gon says to Shmi that she should be proud of Anakin. But not because he is a good kid. No, because he is Force sensitive. This makes Qui Gon colder. Moved here the scene of Maul landing on the planet. It looks like it’s sunset. Then we move to the blood analysis. I kept this scene. No midichlorians, but I like the fact that Skywalkers are so strong in the Force that it can be seen in their blood. Trimmed the whole podrace sequence. Some OT tracks. Reduced race. No Jabba. Anakin starts the race along with all others. Reduced exchange between Qui Gon and Obi Wan. No “Qui Gon, sir, wait, I’m tired”. Trimmed dialogue between Anakin and Padme aboard the ship. Trimmed sequence between Padme and Palpatine. Similar to Sheepish edit. Padme interrupts Palpatine, and no Anakin and Jar Jar. No mention of the Chosen One in the Jedi Council. Trimmed Senate, Anakin’s test and Padme-Palpatine sequences. No mention of midichlorians by Qui Gon. What he says to Anakin looks like a first lesson. Aboard the ship, Dooku radio-contacts Qui Gon. They say: “Qui Gon… my young apprentice”. “Yes, my master”. “The Viceroy of the trade federation is now under the control of a Dark Lord of the Sith called Darth Sidious. You must join me, and together we will destroy the sith!”. The track “Palpatine’s seduction” is used here. Qui Gon doesn’t reply, so it looks like, after this mission, he will actually join Dooku. No mention of Naboo when we see al the gungans. In the royal palace, Gunray says that the droid army has destroyed the planet resistance led by Organa. The battles are not drastically changed. Jar Jar is way reduced. In this movie he is not that present, and so when he is on stage he is not that annoying. The main difference is, as countless other edits have already brilliantly done, that Anakin KNOWS what he is doing. And in the end he saves the day. When he is trying to reactivate his fighter, I mirrored the Luke/Ben scene in the BAttle of Yavin. Anakin hears Qui Gon voice from prior moments of the movie. Then the fighter turns on. With some montage, Padme, after being captured, does not free herself by shooting the droids. The droids have been deactivated by Anakin. So they take the blasters but they don’t shoot. Qui Gon dies without a word. No Yoda and Obi Wan scene. I want to make this trilogy so that the relationship between Obi Wan and Anakin is not that clear. They are friends, not specifically Master-Apprentice. So, in the funeral scene, Obi Wan just says that Anakin will be a Jedi, not that he will train him. Sooooo… I think it flows quite well. Not perfect, but it’s quicker, cheesy lines are reduced, we keep all the main plot points. You’ve got some really aggressive sharpening going on, and I think that is causing blotchiness of the image generally. Yeah, there’s both a sharpening effect and some grain effect. I still have to work on it, especially on the grain. I think you refer to the sky, am I right? Yeah, I noticed that. I’ll reduce the grain. Thank you. Please, correct me if something sounds terrible in english, lol. Reduced Jar Jar, but it must be kept to make him tell Padme the Gungans have an army. Padme interrupts Palpatine twice. At first when Palpy says the awful line about him eradicating corruption. Removed mentions of Alderaan and Naboo, because in the edit Naboo IS Alderaan. I love this idea!! Do it!! Now I’m working on placing scenes in a different order. I think Tatooine at first works pretty well. Then they go to Coruscant and at the end to Alderaan. My problem is that by doing this AND cutting bad parts, runtime is around 1hr and 5 min. 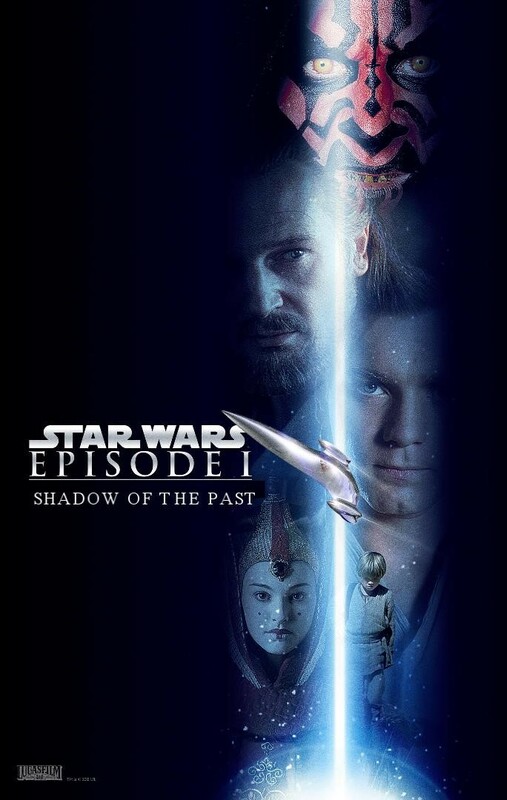 I had to cut the podrace out, all mentions of the Chosen one, the midichlorians, the entire first part of the original movie aboard the Federation ship, etc. Maybe I could re-insert the podrace by making Watto say that he’s already set a bet for Anakin to win the race. So before becoming Qui Gon’s “property” he’ll have to make this final race. This is the best I could do to insert Dooku in the movie. His presence is already set in the opening crawl. Here we have some flipped scenes and audio taken from AOTC. Of course there is the problem of Anakin being in the scene and suddenly disappearing, but I think it can be fixed by placing that somewhere else. Please, tell me what you think about it.